A Native American jewelry company takes a stand for ethical fashion that’s beautiful, too. Above: Check out these beautifully beaded bracelets, and more like them, from Etkie in Albuquerque. A HIGHWAY EXIT AND LITTLE ELSE mark the community of To’hajiilee, a checkerboard outpost of the Navajo Nation about 30 miles west of Albuquerque. 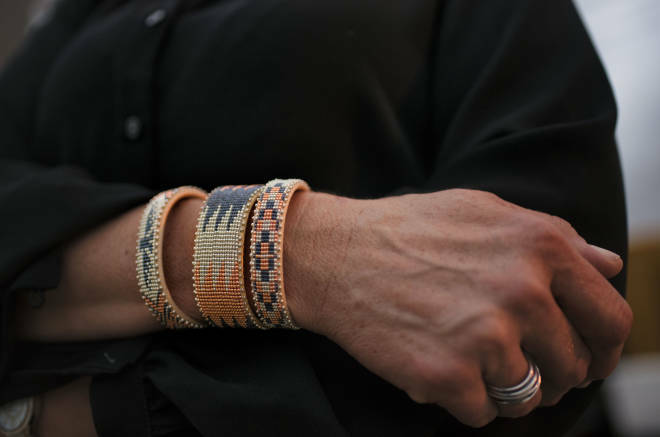 Some 1,500 people live among the stark red mesas and dirt roads—a world away from the haute couture boutiques now carrying beaded bangles from a clutch of mostly To’hajiilee artists. For that entrée into Parisian showrooms and Elle magazine, thank an Estancia woman whose college-era bright idea grew into Etkie, a startup that aims to give unsung artists a living wage and open collaboration. She sits with the 10 artists—mostly Diné, with recent additions from Zuni and Santa Ana Pueblos—in Etkie’s new downtown Albuquerque headquarters. Mirrored mosaic tiles line the walls, catching glints from the artists’ glass-beaded cuffs, crafted in a sophisticated blend of gold, black, and white. Displayed on cowhides and in glass cases, they deliver traditional Native designs with modern twists. The artists gather beads for their next projects, debate colors and designs, and catch up with Alfonso on their lives. Many of the artists live and work in their native communities, but their creations appeal to a world-wide audience, online and in stores, in far greater numbers than they could reach on their own. For Alfonso, the personal touch still matters: In Etkie’s showroom, shoppers can make appointments to see the jewelry and perhaps even meet the makers. Since launching in 2014, Etkie’s designs have appeared in Elle, Vogue Japan, and T: The New York Times Style Magazine. ALFONSO SHOWED HER entrepreneurial knack as a young girl in Estancia. She ran lemonade stands and charged friends to attend her backyard circuses. Studies at Middlebury College, in Vermont, eventually carried her to Turkey, where she fell in love with the region, its people, and their crafts. But their financial struggles struck her heart. She bought piles of multicolored string bracelets and marketed them to sororities along the East Coast. Even at prices affordable to college students, she earned profits in excess of what the original artists could have made at home. A 21-year-old college student herself, Alfonso returned the profits to the artists, and the seed of a notion took root. Her first scouting mission upon returning was with her mother, Kerry Marler, to Albuquerque’s Old Town, where Native artisans and others sell their wares beneath a portal on the plaza’s east side. The artists never know how much money they might make. Sometimes they score. Sometimes they barely earn gas money. Alfonso and Marler sought a beader with enough skill to craft jewelry that a woman in Paris would covet. They found Dru Chackee, a Diné beader of more than 20 years. Hopscotching among relatives’ couches, she eked out a living with her -beaded barrettes and necklaces. Alfonso made her Etkie’s first artist, and Chackee created samples for the crowdfunded Indiegogo campaign that kicked things off. Both gambled—Alfonso on hitching her dream to a stranger, and Chackee on trusting an untested entrepreneur. Alfonso’s consistency soon built a foundation of trust and helped attract other artists. Each week, she drove to To’hajiilee to collect work and deliver paychecks—a rarity in a region where unemployment can reach 50 percent. Chackee helped bring aboard her aunt, Priscilla Chapo, now the lead beader, whose job includes maintaining quality across the board; Chapo’s son, Calvert Chapo; and Chackee’s daughter, Naomi Chavez, all from To’hajiilee. Some were new to the craft. Others picked it up while watching relatives bead. Although beadwork is a Plains Indian tradition, “it’s a newly traditional craft for Navajos, who have adopted the practice,” says artist relations manager Chelsea Chee, who hails from Cedar Springs, Arizona, on the Navajo Nation. Calvert Chapo started beading at 14 as “something to do” in a community with few after-school activities. Now he relishes beading from a table loom in that same hometown. Before, he put in hours as a gas station cashier and airport parking attendant in Albuquerque. “It’s exciting my art has brought me to success,” he says. Others agree. Prior to joining Etkie, Chavez endured a lengthy shuttle, bus, and train excursion from the reservation to a retail job in Bernalillo. It meant long days away from her toddler son and sometimes nights away when early shifts led her to an aunt’s couch in Albuquerque. Now she works from home and earns more doing it. Dru Chackee has found a place to live in Albuquerque and, like many of the artists, owns a car—a hard-won luxury she credits to her work with Etkie. This past fall, Etkie began working with Project Equity, a San Francisco Bay Area consultancy that helps mission-driven companies become worker-owned. As a cooperative, the artists could soon share in profits and take part in decision-making. “We want to create a workplace that shows dignity to everyone involved,” Alfonso says. AROUND THE TABLE, artists string delicate seed beads onto their looms. The beads hover on nylon threads, as if they were floating in midair, before settling into Diné rug and blanket patterns. Some bear a stylized cross, a symbol of Spider Woman, the first weaver, who created a map of the universe and patterns of spirit beings in the night sky. Alfonso relies on her artists to determine which Native designs they’ll use and helps dream up modern twists and color schemes, incorporating diamond and zigzag patterns and, most recently, branching into colors inspired by the desert soil and sky: chocolate, beige, and blue. Chee often researches Native symbols woven into the bracelets to ensure Etkie doesn’t share sacred imagery.